For the dressing, chop chives and garlic. In a small bowl, whisk together lemon juice, garlic, chives, yogurt and olive oil. Season with salt and pepper. 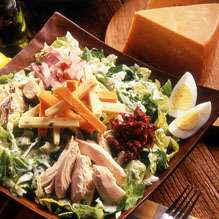 For the salad, toss together greens, bacon, chicken breast, artichoke hearts, tomatoes, cheeses and hard boiled eggs. Drizzle with salad dressing and toss until well coated.